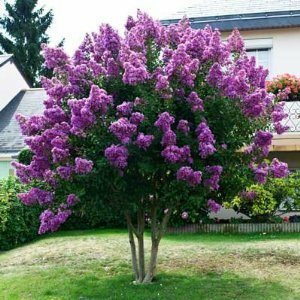 The Crape Myrtle, occasionally misspelled Crepe Myrtle, is a flowering deciduous or evergreen tree that gardeners frequently use to bring a flash of color and delight to the garden. With varieties known as the Red ‘Dynamite’ Crape Myrtle, ‘Twilight’ Crape Myrtle, and ‘Red Rocket’ Crape Myrtle, it is not surprising the Lagerstroemia family is known for its brilliant colors. These vibrant accents are small to medium sized flowering trees that display showy, vivacious colors in spring and summer. The aforementioned Twilight Crape Myrtle is especially delightful, as the bark changes colors, too. I love to grab some Jane Austen or Charles Dickens and curl up under the fairy-touched petals for a breezy afternoon read. These stunning Crape Myrtles have been carefully cultivated in warmer climates around the world to offer the brilliant hues for which they are known. When the Crape Myrtle is planted in temperate or cooler climates, the flowers will fall, exchanging their color with the leaves that will display fiery reds and oranges for the autumn. Careful with your location, though – Crape Myrtles prefer USDA Hardiness zones 7-9, which fall south of the central United States and move north only along the west coast. Some species, such as the Red Rocket Crape Myrtle, the Muskogee Crape, the Red Black Diamond Crape Myrtle, and the Strawberry Dazzle can grow in more northern climates. If you have been searching for a tree that will bring color and attention to your yard or garden, look no further than these primarily disease resistant and gardener-friendly flowering trees. Sunlight – Plant in full sun. Partial afternoon shade is also manageable for several species. Dappled Shade is not effective. Soil – Plant in well-drained, moist soil that is not overly wet. Acidic or alkaline soils are fine, as is somewhat dry soil, though moderate moisture preferred. Water – Water once a week for the first two seasons; though generally drought resistant, some watering may be required during extended dry spells. Pruning – Minor pruning needed; prune in early spring in warmer climates. In cold climates, wait until late spring or early summer, as damage from the cold may occur. 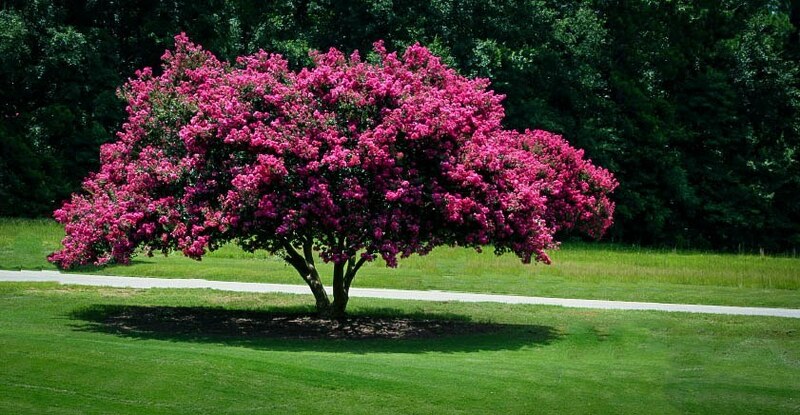 Crape Myrtles are summer-loving, sun-adoring trees. The depth of summer is when these trees provide their most stunning blooms, preferring full sun with minor afternoon shade to achieve the full effect. Heat is of no concern to the Crape Myrtle, which prefers this too a cooler climate. Some species of Crape Myrtle can be planted as far north as Michigan and New York, though most do not grow well above Oklahoma or Maryland. All Crape Myrtles, however, love the west coast, offering their showy blooms to residents as far north as northwestern Washington. When choosing a Crape Myrtle, remember there are dozens of varieties to choose from, each offering a different variety of color and height. It is best to spend the initial planning time choosing the right tree, as this will save you time in pruning and daily maintenance later on. Investigate your property to find a full-sun location, where your new Crape Myrtle will receive hearty full doses of sunshine. Soil is much less of a concern, as most Crape Myrtles are adaptable to even poor soils, though a small amount of fertilizer can be beneficial if this is the case. Few Crape Myrtles grow well in overly wet locations, such as flood plains. Once you have found the perfect location and chosen the right cultivar, order your Crape Myrtle from The Tree Center. Plant and watch the tree provide stunning spring and summer beauty. Crape Myrtletrees vary significantly with regard to growth rate and mature height. 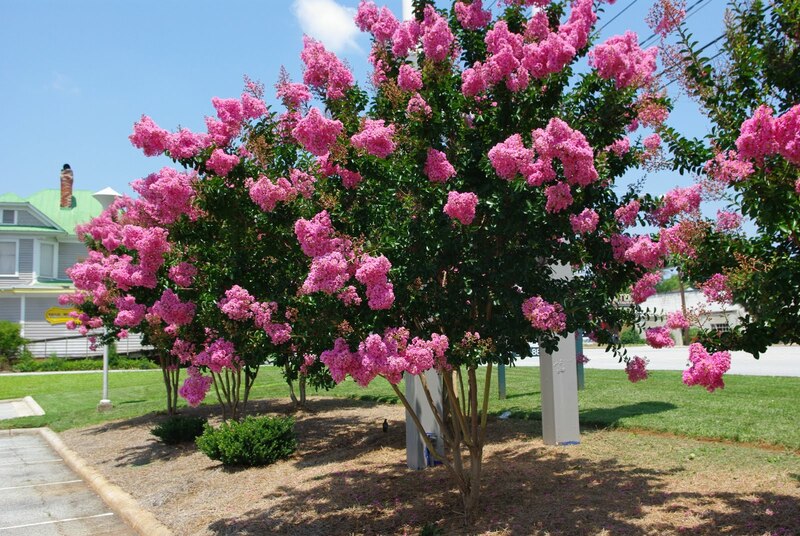 Most Crape Myrtles are fast-growing, offering between 3 and 5 feet of new growth a year, so you can be sure your new tree will quickly provide you the color for which it is known. Some species demonstrate moderate growth of between 1 and 3 feet a year. Mature height varies, too. Some Crape Myrtles will tower between 30 and 40 feet, while others offer beauty to smaller spaces, reaching only between 4 and 8 feet tall. Lavender petals abound on the Muskogee Crape Myrtle, which also extends its growing range to include zones 7 through 11. This Crape Myrtle will reach between 15 and 25 feet, making it ideal as an accent tree or privacy hedge. Planted in the correct location with proper care, the Muskogee Crape Myrtle will offer color for up to 5 months. 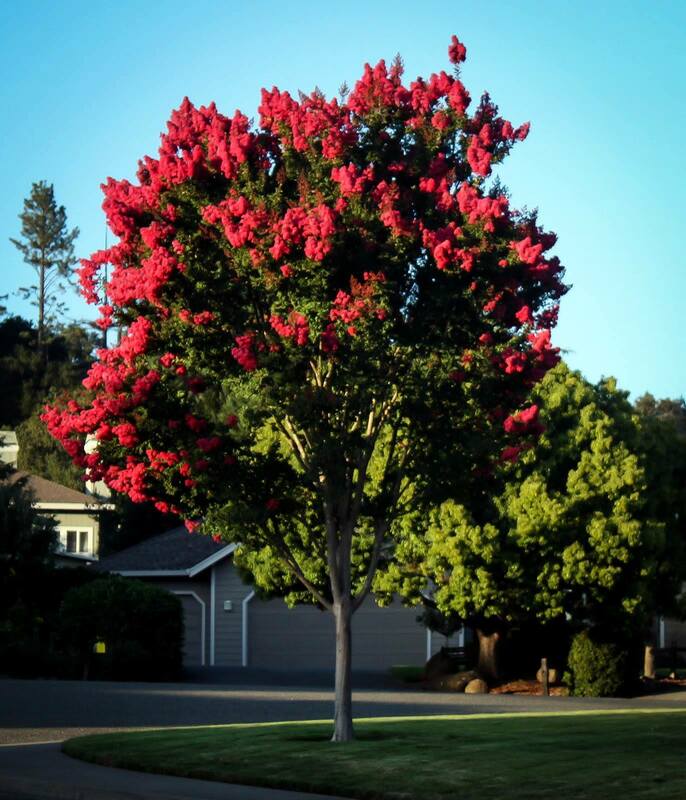 Red blooms accompany this Crape Myrtle, which grows well in zones 7 through 9. 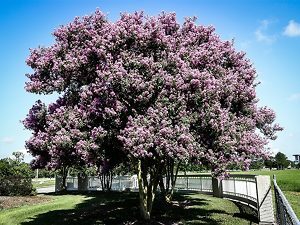 With fast-growth of up to 5 feet a year, the Arapaho Crape Myrtle will dazzle as a 15 foot accent tree or colorful privacy screen hedge. As the name implies, vibrant pink flowers await you with this stunning tree or tall shrub, which reaches between 8 and 10 feet tall. Perfect for a small space or hedge area, the Pink Velour Crape Myrtle offers magnificent, vivacious summer color. Rich purple blooms accompany the Twilight Crape Myrtle, which has a twinge of fairy magic to it. 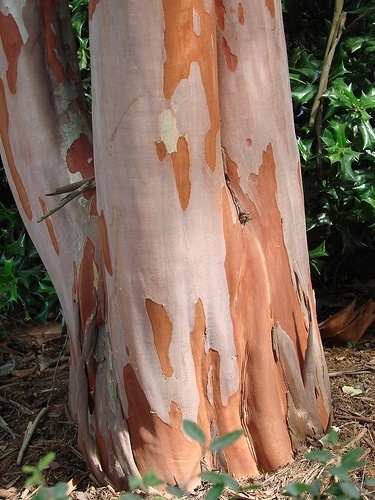 In early summer, the gray bark peels to reveal light pink to reddish-brown bark. The vibrant purples on this tree are not to be outdone, and the tree reaches between 20 and 25 feet tall. For those looking for a colorful Crape Myrtle that will fit into a small space, the Strawberry Dazzle Crape Myrtle is perfect, reaching between 4 and 5 feet tall. 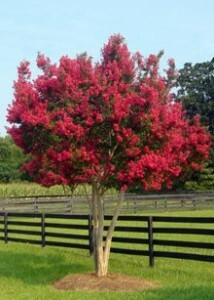 This bright pink-red flowering tree can be planted in a container if temperature changes or yard space are a concern. 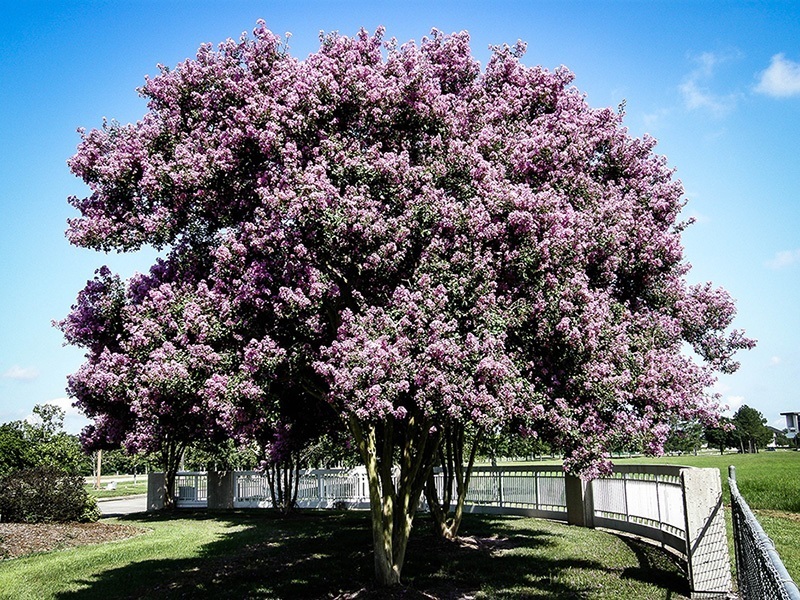 Check out The Tree Center’s Crape Myrtle collection for other varieties, such as the Red Rocket Crape Myrtle or Natchez Crape. Crape Myrtles do not like heavy shade – avoid shaded areas when planting. The genus name, Lagerstroemia, comes from a Swedish merchant named Magnus von Lagerström who shipped the plants to Carolus Linnaeus. 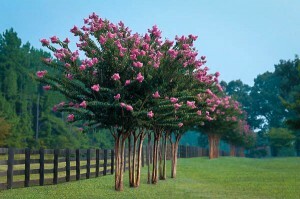 Crape Myrtles provide surprisingly great timber, which has been used in construction projects. Many insect species’ larvae, such as moths, feed on different Crape Myrtle species. i am looking for twiilight about 8-10 foot trees. I need them for a fence line and live in Heath, Texas. I need probably 5. Can you assist?